Kevin co-founded ROW ViGOR in 2016 after previous CEO experience at multiple technology startups. Prior to his startup experience, he worked in finance as a portfolio manager and Mergers and Acquisitions director. Kevin also spent time as a business development director at an energy company, where he led energy infrastructure deals in North America. Kevin graduated from University of Pennsylvania (Wharton) in 1995 with his bachelor’s degree in Management and Marketing, where he was also a member of the football team. He received an MBA with a concentration in Mergers and Acquisitions from Emory University in 2000 where he was a Toigo Finance Fellow. Kevin also received his JD from University of Chicago in 2007 during which time he participated in the second season of the TV show ‘The Apprentice’, where he made it to the semifinal round. Fola co-founded ROW ViGOR in 2016 after working multiple positions within the fitness industry. He has over 15 years of experience in fitness and worked as a Fitness Consultant, Personal Trainer, and Sales Director before joining ROW ViGOR. He has multiple fitness certifications, including a biomechanics specialty certification. Fola attended the University of Maryland at College Park and studied Kinesiology. Moses joined ROW ViGOR in 2017 after serving as a software developer for a startup in the Washington, D.C. area. He has over 10 years of experience working at digital media, litigation, and energy companies. Moses also worked as a software engineer for the NASA Goddard Space Flight Center from 2001 to 2007. He graduated from Worcester Polytechnic Institute with his bachelor’s degree in Electrical Engineering in 2002. Brennan joined ROW ViGOR in 2018 after working as a software engineer at Exegy, Inc., a provider of market data systems to major financial institutions. Prior to Exegy, Brennan worked for 13 years as a software developer and systems data analyst for BJC Healthcare, a health services provider in Missouri and Illinois. Brennan graduated from the University of Pennsylvania in 1996 with a degree in Economics. Sarah joined the ROW ViGOR team in 2018. She also is the owner and founder of Kinetic Legal, where she works to support the health and wellness industry by providing legal advice to business owners and startups on a variety of issues including mitigating risk, managing intellectual property, and brand management. She has over eight years of law experience after receiving her JD from the University of Denver – Sturm College of Law in 2010. Sarah also graduated from the University of Idaho in 2005, where she was a member of the soccer team and received her degree in Public Relations. 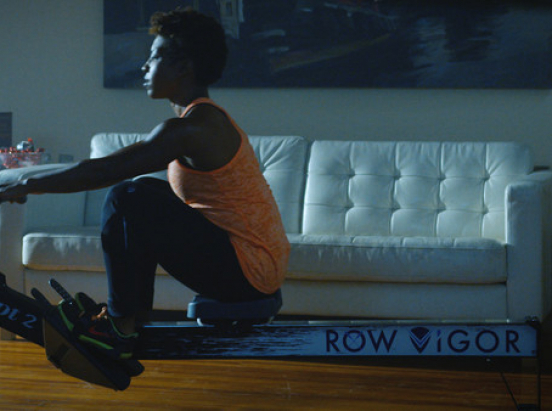 $5,000: ROW ViGOR swag bag and an Apple TV that you can pair with your ROW ViGOR app to stream the workout program developed for you by Coach Fola. *You are investing in a Crowd Note in this offering. Perks are meant to be a thank you from the company for investing. The perks above are NOT INCLUSIVE of lower dollar amount perks. Travel and related expenses are not included unless otherwise stated. Shipping, where applicable, is included for domestic and international addresses.